I entered the Snark hunting grounds in December 2008. http://www.artandpopularculture.com/User:Goetzkluge could give you an idea where I was in 2010. 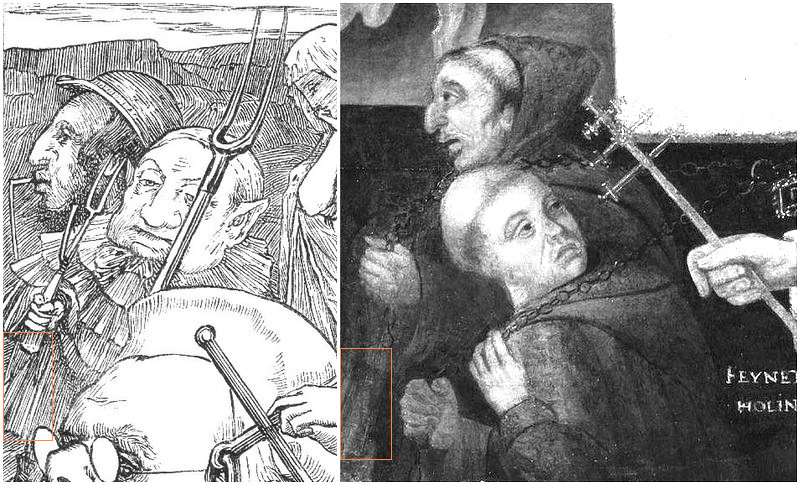 Illustrations by Henry Holiday (from The Hunting of the Snark, 1876) and Marcus Gheeraerts the Elder (Allegory of Iconoclasts, aka The Image Breakers, around 1567): In the “mouth” of Gheeraerts’ “head” a praying priest is depicted. The shape of the priest also is visible in the “mouth” of Holiday’s vanishing “Baker”. There is more — with acknowledgments to Mahendra Singh, to John Tufail and to the Internet. 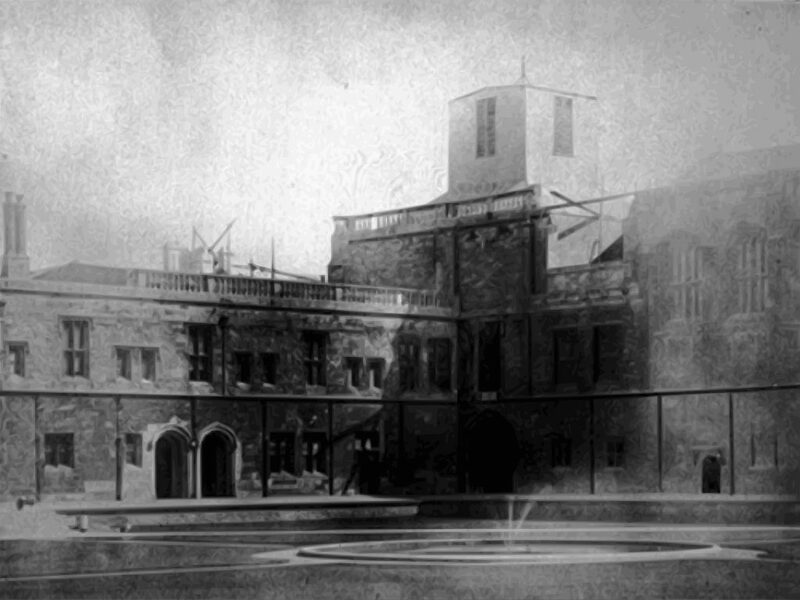 [The New Belfry of Christ Church, Oxford] is of the best of Dodgson’s Oxford squibs, a good humored but cutting attack on Dean Liddell (the father of Alice) and the wooden cube built to contain the Cathedral bells during operations to build a new tower. Though it can still be found today behind the stone walls of the tower, the wooden cube was always a temporary plan but Dodgson was impatient and the Governing body were slow. § 7. On the impetus given to Art in England by the new Belfry, Ch. Ch. The idea has spread far and wide, and is rapidly pervading all branches of manufacture. Already an enterprising maker of bonnet-boxes is advertising ‘the Belfry pattern’: two builders of bathing-machines[MG025] at Ramsgate have followed his example: one of the great London houses is supplying ‘bar-soap’ cut in the same striking and symmetrical form: and we are credibly informed that Borwick’s Baking Powder and Thorley’s Food for Cattle are now sold in no other shape. 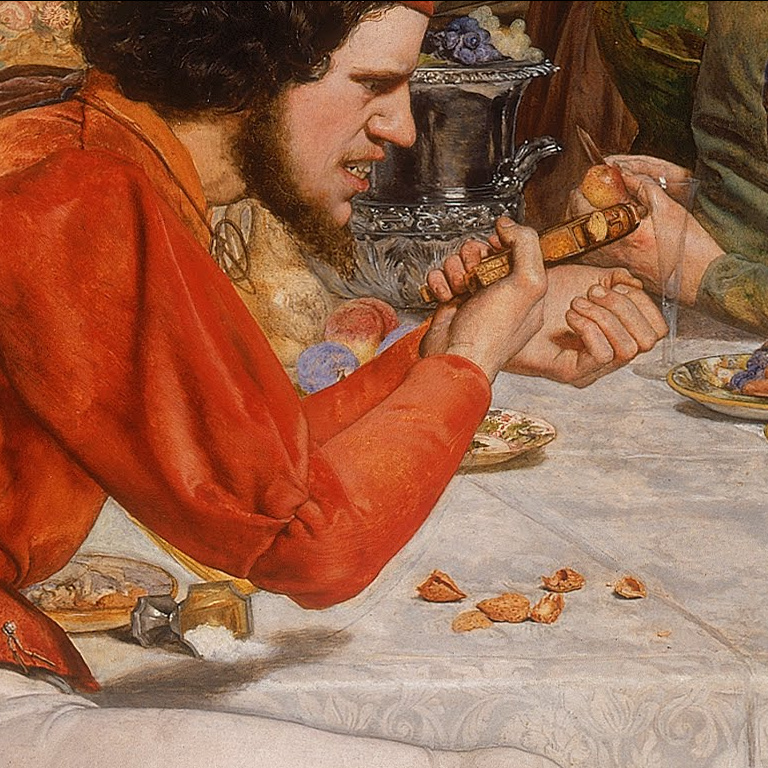 In this allegorical English School painting (ca. 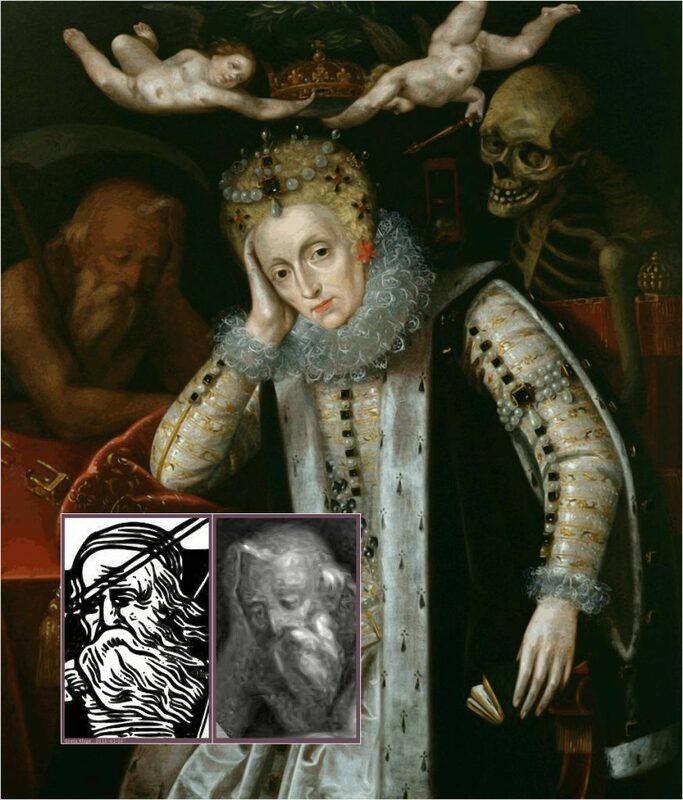 1610, by an unknown painter) of Queen Elizabeth I at old age you see the allegories of Death and of Father Time. 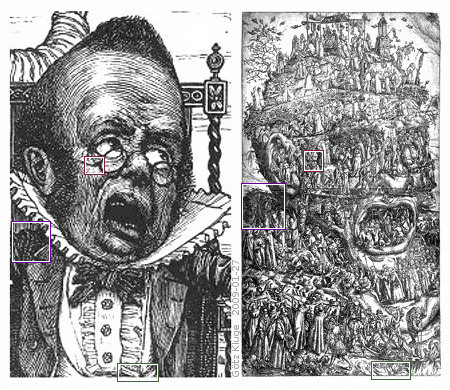 In the inset you see on the left side a depiction of the Bellman from Henry Holiday’s front cover illustration to Lewis Carroll’s The Hunting of the Snark (1876). Only now, after a few years of having found this painting, I recognized, that not only Henry Holiday’s Bellman looks like that unknown painter’s Father Time, But also the posture of the old queen and the old man are similar. 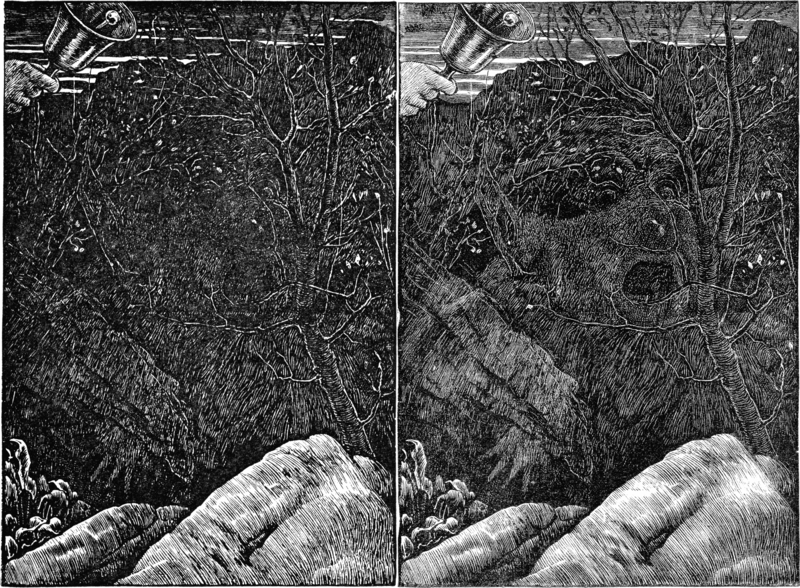 On the left side of this image comparison you see a scan (source: commons.wikimedia.org) of Henry Holiday’s illustration to the final chapter The Vanishing in Lewis Carroll’s The Hunting of the Snark. 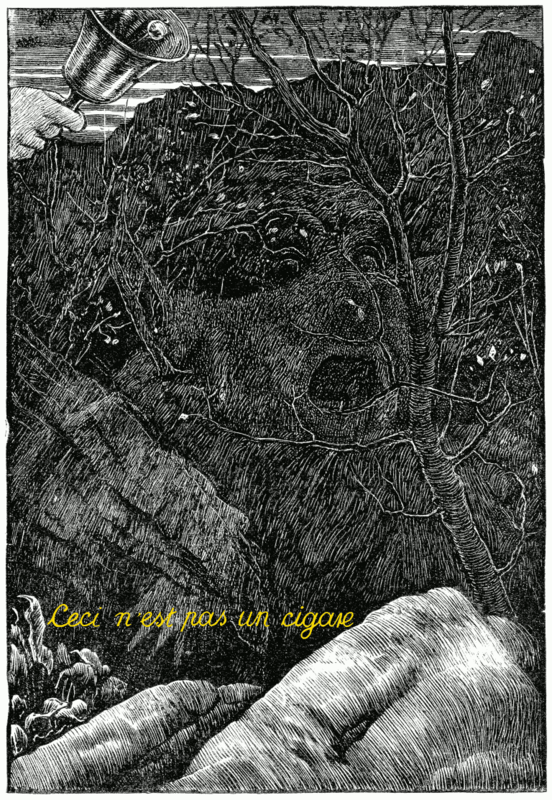 It already is a quite faithful reproduction of the original illustration. 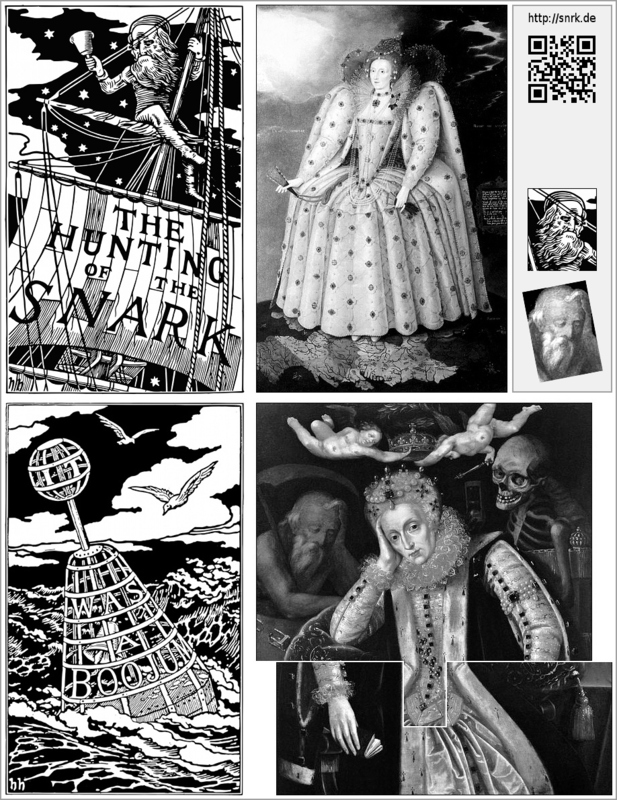 In prints made by Ian Mortimer (for a limited edition of The Hunting of the Snark published by Macmillan in 1993) from Joseph Swain’s original woodblocks, the illustration has better quality, but looks even darker. That is as faithful to the original as it can get. I think that in the original printing, the dark areas of the illustration grew wider than it was intended by Henry Holiday. It looks as if too much black ink spilled into the white areas. 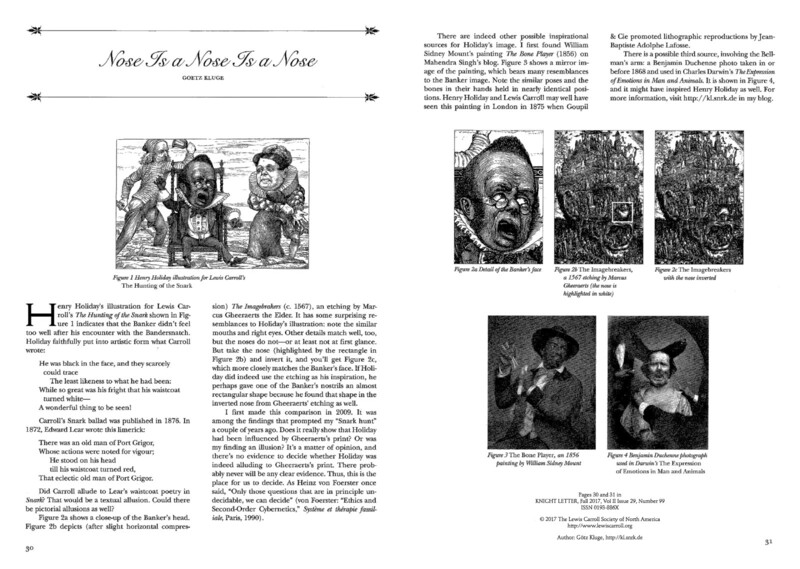 Therefore I scanned the illustration from my own 1st edition of The Hunting of the Snark. Then I grew the white areas a bit. (First I enlarged the image by 2:1. 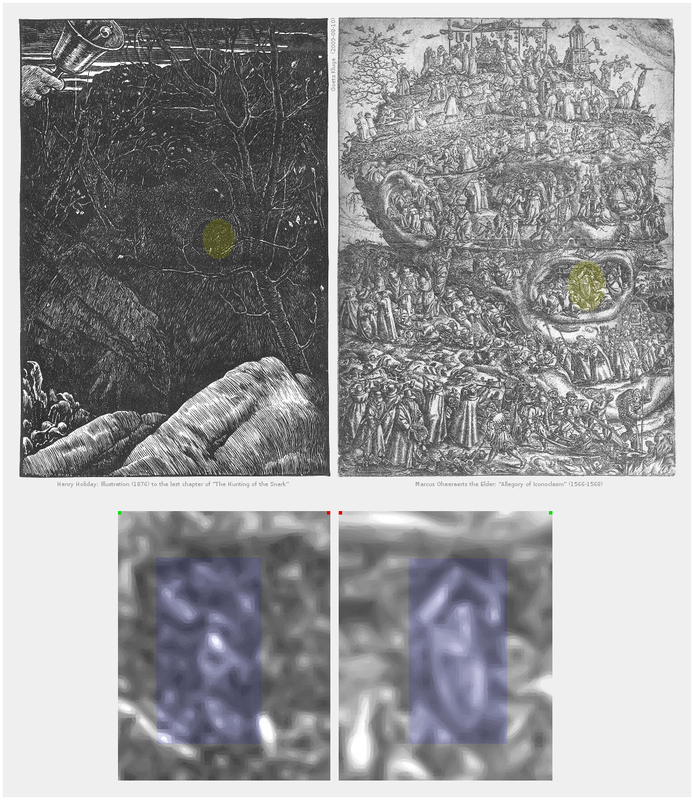 Then I applied GIMP → Filters → Generic → Delate. After that I scaled the image back to its previous size.) You see the result on the right side.